Light-emitting diodes—or LEDs, as they are commonly known—have been slowly replacing incandescent light bulbs in applications ranging from car taillights to indicators on electronics since their invention in the 1960s. 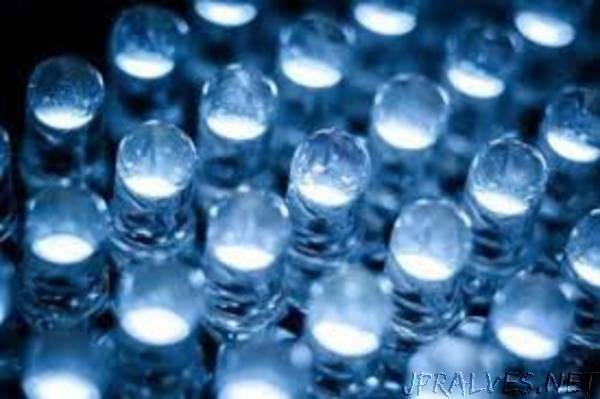 Eschewing the filament of an incandescent bulb and the mercury vapor of a fluorescent bulb, LEDs instead generate light by applying a voltage across a semiconductor. Electrons combine with holes (places in the crystalline structure where an electron could but does not exist, making them positively charged), leading to the emission of photons—particles of light. “More than 10 percent of electricity generated in the U.S. is used for lighting in the commercial and residential sectors. A switch to the widespread use of LED lighting would lead to dramatic energy savings, but efficiency droop is a major roadblock,” says Marco Bernardi, assistant professor of applied physics and materials science in the Division of Engineering and Applied Science at Caltech and corresponding author of a recent paper on the source of efficiency droop that was published in Nano Letters. Efficiency droop occurs when excited electrons overshoot nanometer-deep quantum wells in GaN. The wells are designed to trap electrons into combining with holes. When electrons are too energetic to be trapped by the wells, they leak out of LED devices without emitting any light. “Several models have been proposed to explain this electron leakage, but they tend to focus on qualitative analyses that use intuition to justify experimental evidence,” Bernardi says. Using new computational methods developed at Caltech, a team led by Bernardi studied GaN at an atomic level and how lattice vibrations—the background “hum” of atomic thermal motions in a solid—affect electrons in the material. It was known that this hum drains energy from both electrons and holes. However, Bernardi found that the drain occurs faster for holes than electrons—a mismatch that allows the electrons to overshoot quantum wells, escaping the GaN without ever combining with holes and emitting light. “Our work shows for the first time that the ever-present interaction between electrons with lattice vibrations can, by itself, explain why excited electrons can leak out of the active layer and account for inefficiencies in GaN LEDs,” Bernardi says. Bernardi and his colleagues have not yet finished investigating droop in GaN. Next, they plan to study how droop depends on temperature and other material properties.